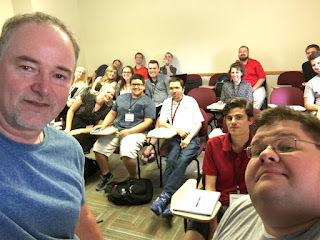 In the summer of 2017, Joe Gisondi and I taught the sports journalism workshop at the ACP/CMA/CBI/CMBAM Mega College Media Workshop in Minneapolis. Below are the stories produced by the students in the workshop. I wanted to make certain their work was published somewhere, and this seemed like as good a place as any. Please enjoy and share their work. Baseball season is a grind. Every team faces its ups and downs, but knowing that doesn’t make the sinking ship any less frustrating. Right now, the St. Paul Saints are sinking fast. St. Paul dropped its fourth straight game Thursday with a 6-4 loss to the Sioux Falls Canaries. It marks the first time all year that St. Paul has been swept in a four-game home series, and with Winnipeg’s four-game winning streak, the Saints’ lead in the division is down to only one game. Thursday was supposed to be the game St. Paul got back on track. Pitcher Mark Hamburger took the mound for St. Paul, which usually results in a win. Through 11 starts before Thursday, Hamburger held a record of 9-1 and an ERA of 2.86. He had won each of his past seven starts. “We trust our guys,” first baseman Brady Shoemaker said. “We trust all of them. Mark has obviously done well this year and before. When he goes out on the mound it’s the same thing. We know he’s going to keep us in the game. Those runs Shoemaker mentioned never seemed to materialize. Sioux Falls scored a run in the top of the first to take a lead, and St. Paul was playing catch-up for several innings. In the bottom of the fourth, St. Paul finally broke through and took a 3-1 lead thanks to a solo home run by Shoemaker. St. Paul tacked on one more run in the seventh inning, but ultimately a two-run ninth inning for Sioux Falls was the difference. In a rare bad outing for Hamburger, the four runs produced by the offense weren’t enough. St. Paul got outhit 12-8 by the Canaries Thursday night and outscored 23-12 in the four game series. Scoring three runs per game usually isn’t enough, and the Saints know that. “We’ve just got to stick to what we’ve done throughout the season,” Shoemaker said. “We’re in a little rut right here, but when you start trying to do too much, you kind of put yourself in a hole. 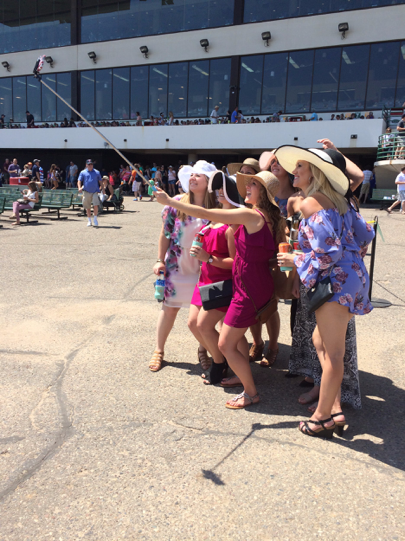 It was the 11th annual Extreme Race Day at Canterbury Park in Shakopee, Minnesota, Saturday, but for announcer Paul Allen it was just another day at the track. Allen has been announcing races for Canterbury since 1995. Allen said he’s announced races every summer at Canterbury since he got the job, and only misses races when the Minnesota Vikings have a preseason game. Allen also calls play-by-play for the Vikings on 100.3 KFAN in Minneapolis. He also has a daily radio show that airs from 9 a.m. to noon on KFAN. Allen says he grew up in Oxon Hill, Maryland, and lived in an apartment building that overlooked a local racetrack. “I’d always see lights and hear the announcer and see the horses going around and even at a young age I was into it,” Allen said. In 1979 Allen moved to Los Angeles, and that was when he fell in love with horse racing when his parents took him to Santa Anita, California, when he was 12. This is Allen’s 23rd season at Canterbury Park and says he’s probably called over 25,000 races. Even though he announces the races, Allen places bets on all of them. “I like betting. I’m not a sports betting type of guy, but I like trying to put a little bit of money to make a lot via the pick fours and pick fives,” Allen said. Allen has called all of the extreme races every year. This includes camel, ostrich and zebra races. Allen says he loves calling these races because they’re entertaining and fun for the fans. “Unless you’ve ever been right up next to an ostrich you don’t know that it’s the most devilish looking thing you’ll see in your life. I really feed off the crowd, and it’s nice cause it breaks up the monotony of regular racing day after day,” Allen said. Allen said his favorite thing about horse racing is the unspoken family unit that has developed not only in Minnesota but around the entire country. The trainers and jockeys at Canterbury Park come in from all over the country, and they’re only here for three and a half months. They then leave when the season is over. SAINT PAUL, Minn. _ Directly behind the center field billboard at CHS Field, three royal blue, black and white colored inflatable contraptions make up the Kids Zone. One is an obstacle course for kids to crawl, climb, slide and tumble through. Another, a target for fans to test the throwing speed of their pitching arms. 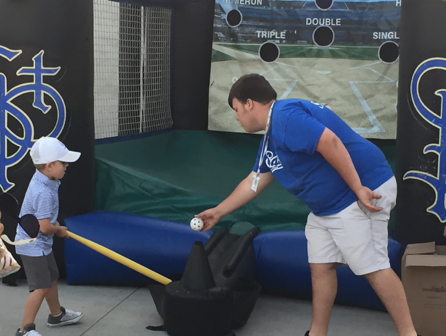 At the last inflatable device, St. Paul Saints game day intern Jacob Hess plays the role of hitting coach. He hands kids a skinny, plastic, yellow bat for five swings as they step right up to his batting tee. As he sets the whiffle balls over the tee, one by one the kids begin swinging, but the hitting that ensues isn’t anything like out of Backyard Baseball. Hess, a 19-year-old sports management student at the University of Wisconsin-Stout and Minneapolis native, is one of 45 full and part-time game day interns for the St. Paul Saints. It’s his fourth consecutive shift at the ballpark helping out with the Kids Zone. Of the 54 games played so far this season, Hess has missed just three. While not seemingly important on the surface to run a Saints home game, these interns are essential in operating CHS Field, helping give the ballpark its usual zest on any given game day. The responsibilities of these interns are plentiful. Intern duties composed of ones such as Hess’ helping out in the Kids Zone to being a party organizer for fans or doing promotional work on the field between innings to entertain the massive crowds. On this particular Saturday night, the Saints are playing the RedHawks of Fargo-Moorhead with over 8,700 fans in attendance. Another intern, Kadee Cooper, a 21-year-old communications and marketing student at the University of North Dakota from Minneapolis, has been assigned to do recruiting and on the on-field promo work. For recruiting, Cooper navigates her way through the pre-game crowds and searches for young fans who may want to participate in on-field events between innings. Once that’s done, she helps carries out promo work, taking the field with other interns to make the ballpark experience for fans as fun as possible. She says she enjoys the relationships she’s made with the other fellow interns the most. “The environment is really fun and we’re all close with each other and spend a lot of time with each other, especially on the weekends,” Cooper said. In the mid-second inning, four interns lined up on the left field line for one of the promo events. Standing with four men wearing orange and white baseball style shirts and a differently colored car tire at their sides, it was on the interns’ mark when each man quickly rolled out their colored tire around the outer rim of the diamond in a race. As the men raced closer to the toilet paper finish line, the crowd delighted in every moment, and the interns cheered as one man finally broke the toilet paper finish line in a non-athletic manner. It’s the little events like these that the interns help out with which make CHS Field a fun place for fans. One person who’s had a close-up view of the interns’ value is Sierra Bailey, the director of marketing and promotions at CHS Field, whose in her fourth season in the position. Not only did she say the interns are valuable in their game day operations, but hopes the experience they’re getting at the park will serve them well in the future. As the game between the RedHawks and Saints dragged out into extra innings, it was finally time for Jacob and the team to break down the Kids Zone. They deflated their contraptions and rolled them up behind the billboard in centerfield, then enjoyed the rest of the game from the view of the Saints’ tunnel. Although it wasn’t a Saints win, 32 total runs scored and was still another exciting night for Jacob at the ballpark. ST. PAUL, Minn. — Barbara Skoglund watched from the comfort of her home as St. Paul Saints’ center fielder Kes Carter launched a ninth-inning walk-off home run to lead his team to a 6-5 victory over the Fargo-Moorhead Redhawks Friday night. Before the game Skoglund hopped off the Metro Line and walked to CHS field a Saints jersey on her back and season tickets in her hand. The Metroplex native has been a season-ticket holder with the Saints since December 1992, a year before the organization began play. Since then, she has been a loyal fan to the team through the cramped space and metal benches at Midway Stadium, to section 108, row 19 at the renowned CHS Field. Skoglund, 79, said she brings family and old high school friends with her to enjoy the game, but then leaves around nine o’clock so she can tune in at home and avoid the post-game hassle. Having watched the team for 25 years, Skoglund has made herself familiar with some of the staff, including Derek Sharrer, the Saints’ executive vice president and general manager. One of Skoglund’s favorite players on the team is the second baseman, Tony Thomas. She described him as ‘one of the good players’ because of his attitude and effort towards the game. In a player perspective, Thomas said he felt the same toward the fans. “We feed off their energy, that’s why we do well here,” Thomas said. Although Skoglund said she doesn’t like being around the big crowds of people, she still shows up because of her love for the game — and the nice view behind home plate. She added that she plans to keep coming for quality family time with her son and granddaughter. SHAKOPEE, Minn. - Canterbury Park jockey Oscar Delgado didn’t know what to expect upon first mounting Alexander Camelton, one of the four loping, single-humped camels competing in the park’s annual “Extreme Race Day” exotic animal racing event. A horse rider by trade and fierce competitor by nature, Delgado’s participation in the comedic weekend exhibition contest atop camelback for a audience comprised primarily of families and children was strikingly polar to his everyday routine on the race track. Understandably, when the gates opened and Alexander Camelton sprinted out to an early lead, he decided to live in the moment and go with it. Together, Delgado and Camelton used their initial burst of speed to separate from their competitors and never slowed their pace, securing the top placement in the first of three exotic animal racing events taking place during the sweltering July afternoon. Though a vast departure to his usual races, Delgado’s attributes much of his positive experience to the large crowd in attendance. When Delgado advanced to the winner’s circle for photographs, the crowd was still bustling with excitement from the unorthodox event, and it’s that exact electrifying energy that led him to Canterbury Park in the first place. Originally hailing from Mexico, Delgado moved to Michigan in 2007 to pursue horse racing, a family tradition shared by his father, brother and grandfather. Ever since, he’s successfully honed and fostered his craft in many tracks throughout the Midwest. This being his first summer racing at Canterbury, he seems to have found a home in Minnesota. 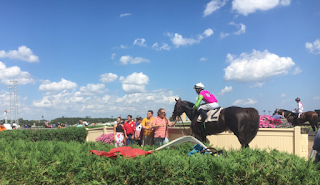 After being named the Minnesota Quarter Horse Racing Association’s jockey of the month on July 14, Delgado and Canterbury seem like a perfect match that should continue to produce exciting results in the coming seasons, whether the races feature horses, camels or any animal of the sort. Leslie Mawing and Nutty Futty ride into the winner’s circle. SHAKOPEE, Minn. __ Forty legs dug into turf, but only 36 kicked up dirt as the sounds of whip cracks filled the stadium on Saturday. Nineteen jockeys raced their horses in the “Battle of the Surfaces” at Canterbury Park on July 15. Although it was Extreme Race Day, other exciting events took place that no one suspected. Leslie Mawing, 43, and his horse Nutty Futty were the first-ever turf victors of the battle. In Mawing’s firs ever appearance in the event, they pulled from behind to finish far ahead of every dirt horse with a time of 1e minute, 41.94 seconds. With 13,315 in attendance, this race definitely did bring out fans of all ages, not only for the exotic animals but the pony rides, petting zoo and face painting. 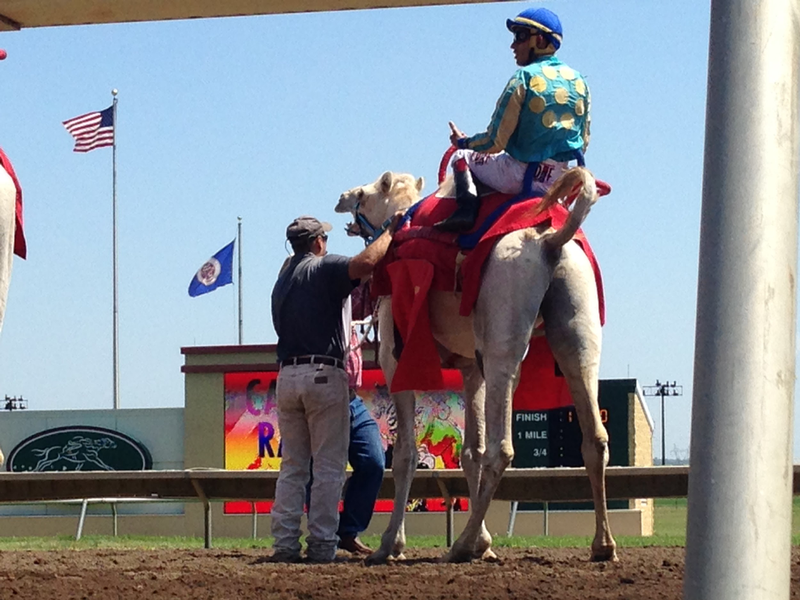 Saturday’s exotic races consisted of high-maintenance zebras and foreign camels. However, these races have never interested Mawing. The 23-year-old South African trained exclusively on turf in homeland. In the winter, Mawing spends his time racing in warmer San Francisco, Calif. In the summer, he heads a fit farther north to Seattle, Wash., to practice. Aside from geography, his heritage is a big factor in his riding abilities. His brother, six years older, rides in California and his cousin rides in South Africa. The most important part of racing is to develop a relationship with the trainer, according to Mawing. Through this, a jockey develops a relationship with the horse. While there are some races where a jockey meets a horse for the first time on the day of, this is not always the case. Social media plays a role in the life of a jockey by allowing them the chance to watch footage of their horse in prior races. If this isn’t applicable, jockeys will communicate with each other and share safety tips. “Riders don’t like to divulge their secrets,” Mawing said. This makes the game even tougher since every horse is different and always requires a jockey to adjust to their natural habits. From Saturday’s race, Mawing had the chance to ride Nutty Futty — owned by Ariel Gordon — in previous years, which gave him another edge in the group. He kept an eye out for Rob’s Pal, who was ridden by Chad Lindsay and laid back as others fought for an early lead. “My horse broke flat-footed from the gate, and I got pinched out of my position causing me to go from plan A to plan B really fast,” Mawing said. At around the three and a half mark, Mawing started to make his move for the lead. He pulled up the outside in a sprint and passed every horse on the turf to secure the lead against Rob’s Pal, who was favored to win. In the future, Mawing said he hopes to ride again at Canterbury Park. A walk-off home run by outfielder Kes Carter spelled relief for the St. Paul Saints Friday night after a tightly pitched game, leading the Saints to a win of 6-5 against the Fargo-Moorhead Redhawks. 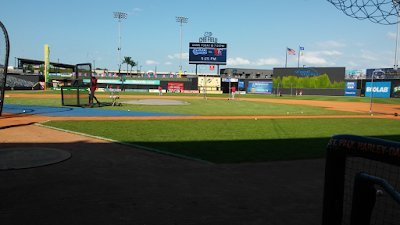 This win spelled an end to a four-game losing streak for the Saints, leaving them seated as the first in the North Division of the American Association of Independent Professional Baseball. The first few innings were by far the most exciting for fans with back to back scoring including some big crowd-pleasing homeruns. However, the Saints showed some difficulties in pitching as starting pitcher Robert Coe, sporting an impressive head of hair in his first outing of this season, gave up three runs in the third and followed by another two in the fourth. “It sort of happens in this league. You make mistake pitch and you’re gonna pay for it,” said Coe, now in his sixth season with the Saints. Coe had been trying some different pitches recently instead of attacking with the straight pitch or fastball he felt he should have been and The Saints did pay for that mistake with two of the three hits scoring homeruns for the Redhawks, who similarly had struggles of their own pitching the first few innings. After a home run by infielder Jon Kristoffersen in the bottom of the fourth, the score was tied 5-5, where it remained for the following three innings as relieving pitchers were brought in. A long stretch of no runs is a most stressful spot for a fan to be in, but this crowd of 9,054 never let it show. “Well, that’s baseball for you,” yelled a member of the crowd. The players feed off of this energy. In an astounding way almost all the Saints have described the fans as one of the most important aspects for them. For this reason many of them proclaim the fans needed this win as much as the team and what a win to reward your fans with a bottom of ninth walk off homerun. “Baseball is supposed to be fun and I mean, as long as we’re having fun we’re gonna win games,” stated Coe. A homerun are not especially rare in baseball but they are not exceptionally common and it is in no way practical or in good judgement to expect them to be the answer to a win and despite all of the excitement, not to mention fireworks, the general atmosphere of the coaching staff still expressed some disappointment in the overall performance and the need for improvement, especially in their pitching. Future bride Kirsten, from southeastern Minn., takes a selfie with the members of her bachelorette party. Three women used the Canterbury Park Exotic Animal races as a venue for their bachelorette parties. Every year, Canterbury Park holds a day of exotic animal races. This year featured camel, ostrich, and zebra races placed intermittently between the normal horse races. The event attracted a mixed crowd of families, regulars, and bachelorettes, despite the 90-degree heat. The three individual bachelorette parties donned their sundresses and oversized hats, pinned on small red or white badges reading “bride-to-be”. One of the parties made the addition of metallic temporary tattoos that said “bride”, or had the likeness of an engagement ring. One of the bridal parties had the honor of standing in the winner’s circle to watch one of the various horse races that day. They stood on an elevated platform where they could see over much of the track, safe from the dust storm created by the races. Bride-to-be Ann Wahlstrom met her fiancée through friends, similar to how her friends planned her bachelorette party. Much like Wahlstrom, bride Kirsten’s party was also planned for her. “I mean, my friends picked it,” Kirsten said, declining to give her last name. “We’re exotic people, we want to see exotic animals,” Kirsten’s maid-of-honor said, then laughed. Kirsten’s party came from the Mankato area, and planned on heading to the Prior Lake Music Fest after the races to catch a bit of country music to complete a full day of activities. The third bride-to-be, Krista Topp, came up with the venue idea slightly differently from the other two women. “It actually happened that I was trying to figure out what to do for my bachelorette party, and we were on somebody’s thirtieth birthday party bus, and one of my friends said that we should come to Canterbury. Because they thought that it would be fun to do the dresses and the big floppy hats,” Topp said. It wasn’t the only significant event in Topp’s life that happened on a bus. She used to ride the same bus as her future fiancée. “We used to ride the school bus together. I knew who he was, he didn’t know who I was, and one of my friends that I made in college started dating somebody from my hometown that she met at country fest, so she introduced me to my fiancée,” Topp told the story of how she had met her fiancée. The Topp party left before the exotic races were over, planning to use the two-hour drive home as an opportunity to bar hop. “It’s really fun to watch the horse races, and today was really fun to watch the exotic races too,” Topp said, leaving minutes before the zebra race would end in the chaos of bucking zebras and sore-bottomed jockeys. If you want to talk to St. Paul Saints Manager George Tsamis, you don’t need a media pass or any exclusive access; you simply need to know blogger Kevin Luckow and try one of his famous green onion bratwursts. While writing for his Saints blog, The 10th Inning Stretch, he received a complaint regarding a decision Tsamis made in that evening’s game. Luckhow had not attended the game that night, but felt an obligation to defend Tsamis’ call. "The saints don't get a lot of media coverage,” Luckhow said. “So Tsamis doesn't get the opportunity to talk and defend himself." Luckow said that he received an email from Tsamis’ wife to thank him for his comments and later talked to Tsamis himself. Luckow saw an opportunity to improve upon the relationship between fans and manager and asked Tsamis if he would like to come to a tailgate and talk to fans in the parking lot. Tsamis agreed and Luckow advertised the opportunity on his blog. The two enjoyed one of Luckow's signature green onion brats while they chatted with fans, and the meet-and-greet event has become a routine at CHS Park. Luckow's time with the Saints doesn’t consist of merely consuming barbecue with the manager, though. In fact, his loyalty to the team originates long before the breaking of ground for CHS. The Saints that he remembers first growing fond of didn't enjoy the luxuries of a state-of-the-art stadium with a price tag north of $60 million. He watched them play, literally, in a dump. Luckow didn't let the poor field conditions turn him away; he instead appreciated the novelties of Midway Park. He grinned as he explained the lawn chairs for spectators on the warning track and the orange temporary fence that separated them from the playing field. The Saints eventually moved away from their industrial home and into CHS field. As the Saints field conditions improved, so did Luckow's dedication with the organization. He started a blog about the independent baseball team. "It started out as a blog for 20 guys who tailgated and then evolved from there," Luckhow said. It's been years since Luckow posted his first blog post and has since evolved from a tailgate update to a full history and analysis of the Saints organizations. He no longer writes the blog from his home; however. These days he updates it from the press box at CHS. Luckow's loyalty has not faltered since being noticed by Saints' management. He stills appreciates the quirkiness surrounding the franchise. The landfill mounds and lawn chairs are a thing of the past, but have since been replaced with other oddities, such as the roaming characters that entertain the fans or the new tradition during which press members toss peanuts to fans below the press box. So if you need to get in contact with George Tsamis, don't fret. Just look for the man hurling peanuts down to the concourse or, if that doesn't do the trick, simply follow the smell of green onion bratwursts. Saint Paul Saints fans taking in a baseball game at CHS Field know that there’s no such thing as a normal night at the ballpark. The Saints do all kinds of wacky things – everything from handing every fan bacon to breaking a record for the world’s largest pillow fight to transforming the entire outfield into an enormous Twister board,. 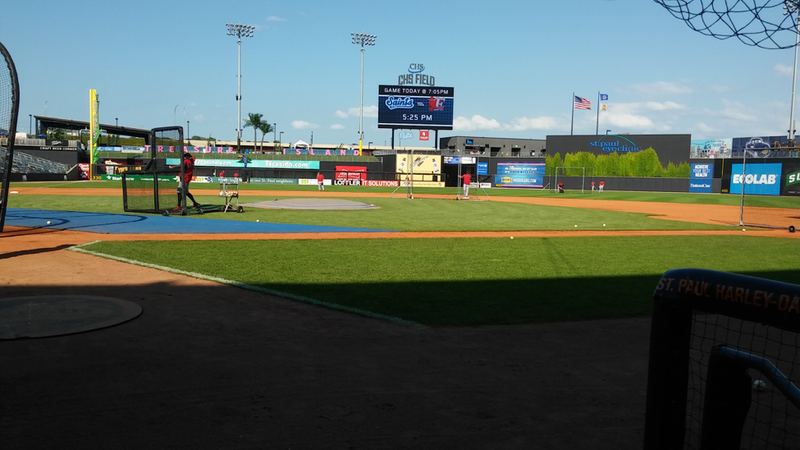 Though attendance numbers at ballparks all across the country have suffered in recent years, especially in the minor leagues, the Saints have used these promotions to help create a fun gameday atmosphere and keep the park packed. Averaging nearly 8,500 people in attendance each game, it’s clear the hard work and creativity have paid off. The team’s attendance nearly doubles that of any other team in the American Association. For Saints marketing and promotions director Sierra Bailey, coming up with fresh and unique ideas is a major part of her job. but she has plenty of help. The Saints rely not just on their marketing team, but on everyone in the organization when it comes to brainstorming. “In the offseason I have monthly promotional meetings and I invite everyone that works for the Saints. Even our groundskeepers come to the meetings,” Bailey said. Bailey, a Minnesota native, interned for the Saints fresh out of college after graduating from University of Minnesota with a sports management degree. After a stint with the Twins and a stint with the Timberwolves she returned to St. Paul to continue what she started. After being with the team for five years, she’s seen a lot. Though she does have a few promotions which she especially enjoyed. Though they have several popular yearly promotions such as Irish night, the Saints constant try to keep fans on their toes. As of late the St. Paul Saints have been struggling to pull out a win. The Saints came into Thursday’s game on a three-game losing streak, facing a hotter Sioux Falls Canaries team, who were riding a four-game winning streak, and slowly closing the gap in the north division. Coming into the game, the Saints were leading the north division; however, the Winnipeg Goldeyes were just two games behind the Saints, so every game is important around this time of year. Making the start for the Saints at pitcher, Mark Hamburger has shown to be impressive with a 9-1 record coming into the game. However, it wasn’t his night. Hamburger got off to a poor start, allowing three hits and one run in the first inning. He managed to go hitless for the next three innings, but then allowed a run in the fifth, sixth, and seventh innings, and was later pulled off the mound with two outs in the seventh. Brady Shoemaker had an impressive night at the plate for the Saints, going 3 for 5 and hitting a triple in the first inning, bringing in a run, and also hitting a single run home run later in the fourth. The Saints capitalized on a few mistakes made by the Canaries, which brought in two runs for the Saints. Going into the ninth the game was tied at 4, until Jabari Henry for the Canaries hit a boomer of a home run, bringing in two runs. This was the first lead for the Canaries since the first inning. The Saints came to bat down by 2 hoping to end the current losing streak and return to winning form. However, this could not be done, with Shoemaker and Carter striking out, the game was over. The final score was 6 to 4, with the Canaries stretching their win streak to five and adding another loss to the Saints losing streak. ST. PAUL, Minn. -- The theme was Tupac vs. Biggie, but that’s not why 9,054 fans showed up Friday night. The St. Paul Saints beat the Fargo-Moorhead Redhawks by one run, 6-5, ending a four-game losing streak. The Saints took down their fellow Midwestern opponents in the bottom of the ninth inning with a home run from outfielder Kes Carter after four innings of being tied 5-5. The teams went back and forth in the third and fourth innings, but it was ultimately the Saints who took this game. “We needed that,” said George Tsamis, the Saints coach. Tsamis and some of the Saints players agreed that the audience watching makes a difference for them and their performance. “Some of these fans have been here from the beginning, many a lot longer than I have. I think it’s great that they’re here this long and have been supporting this long. They deserve to see a winning team,” Tsamis said. Tony Thomas, an infielder for St. Paul who scored one of the team’s five runs on Friday, said the crowd energized the team. When Thomas does eventually step out from under the stadium lights, he has plans for the next generation of baseball players. According to him, the young fans today could be the players of tomorrow. K.D. Kang of the Fargo-Moorhead Redhawks reflected on being a minority on his team as well, as he is one of the only South Korean-born players in league. Nonetheless, his teammates from the midwest, as well as friendly and participating audiences, have made it a good experience for him. A tradition began 25 years ago that remains unique among other independent baseball teams, a ball pig. 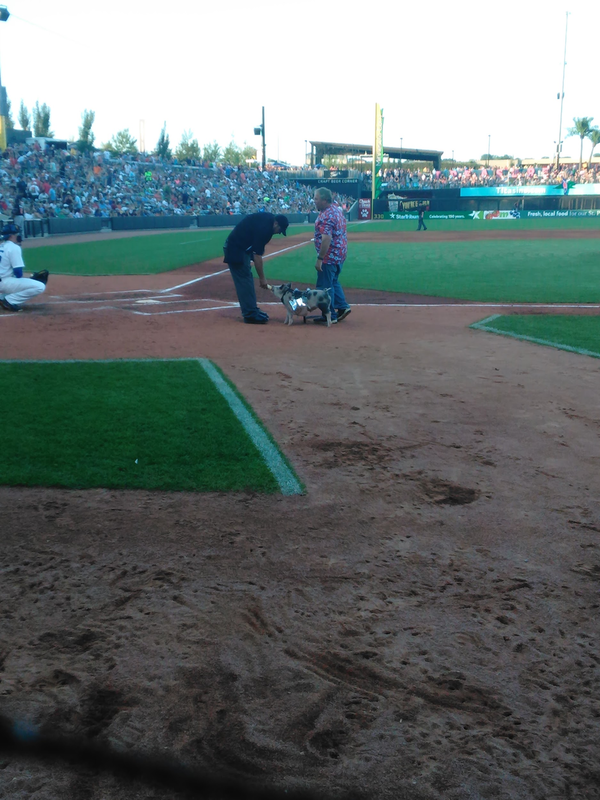 The St. Paul Saints have a new ball pig every year, which brings entertainment and laughs to thousands of fans each season. The original idea for the pig came from Saints owner Mike Veeck. When the Saints rebirthed in 1992, there was no mascot at the time. Veeck’s wife discovered that for a short time St. Paul was referred to as “Pig's Eye,” thus the pig mascot was created from. Fans each week wait patiently for Dennis and Marilyn Hauth to bring this year’s mascot named “Alternative Fats” to the game. The Hauths have supplied the pigs since the idea’s start. “Each year there is a new one. We go to the hog farm and buy them,” Dennis Hauth said. “Alternative Fats” makes his appearance on the field after every completed inning. He tends to visit the umpire wearing different outfits, which owner Marilyn Hauth makes herself. The outfits come in different colors and styles including bunny ears, sparkles, and capes, which always gives the fans a reason to watch every inning. With his own space in the dugout, “Alternative Fats” has his own pen as well. Since the Hauth’s are local, “Alternative Fats” goes home back to their farm every night. With a huge fan base, people cheer as soon as they see a glimpse of the pig ready to take the field. “It's entertaining and very popular,” Dennis Hauth commented. Aside from the fans he attracts, the ball pig is trained to deliver balls to the umpire and follow its handler.